I wish all of you could taste a freshly picked juicy loquat. 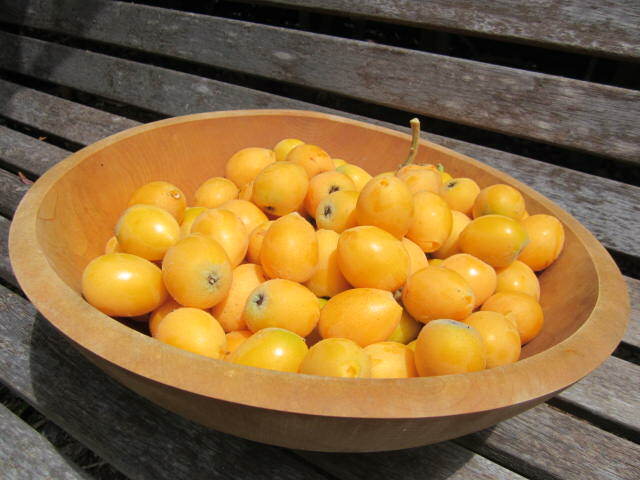 It’s not a kumquat or even a distant relation… I posted a pic of our loquat tree on my Facebook page and was really surprised to learn how many have never tasted this juicy sweet fruit. Thin velvety skin embraces yellowy orange flesh that tastes like a cross between an apricot and a peach. If you have a chance to try them, just remember, the seeds are extremely toxic! They contain many toxic alkaloids like cyanogen-glycosides. Loquats grow all over my SoCal neighborhood — everyone seems to have at least one or two trees and they’re very prolific producers — but no one knows what to do with them, which is really too bad because they’re full of nutrition. Low in calorie,, rich in insoluble dietary fiber; pectin. Excellent source of vitamins A and C, rich in potassium and some B-complex vitamins such as folates, vitamin B-6, and niacin. Plus, loquat jam is delicious. Leave the skins on but cut off the blossom end. Five to six cups of sugar. I used white sugar, but I’m sure you could play around with the amounts and use agave nectar or honey. Two tablespoons cinnamon. Loquats are slightly bland and really respond well to spices. Pour over enough water to cover the fruit. Cover with a lid, quickly bring to a boil, and allow to boil for five minutes. Turn down the flame to simmer, uncover, and cook for a couple of hours, stirring with a wooden spoon so it doesn’t burn. After a couple hours or so, take an immersion blender pureed the fruit (the skins disappear), and continued to cook for another hour. After tasting it, I added a bit more cinnamon and three tablespoons of lemon juice which really helped the flavors develop. 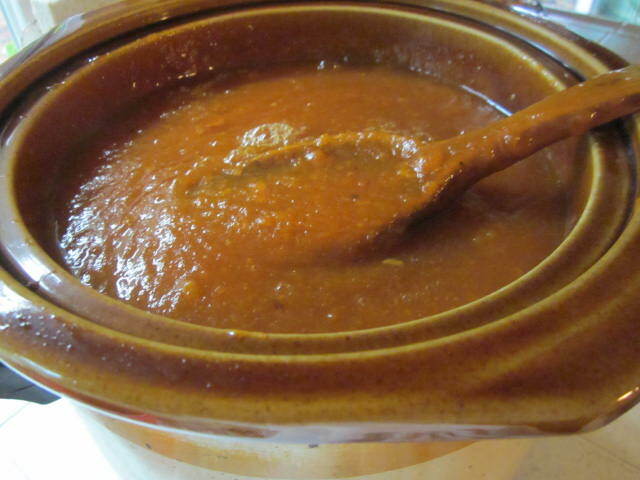 I wanted to turn it more apple butter-like and thick, so I carefully poured it into a crockpot and let it cook on low all night. In the morning, wash canning jars and lids with hot soapy water, rinse with hot water. 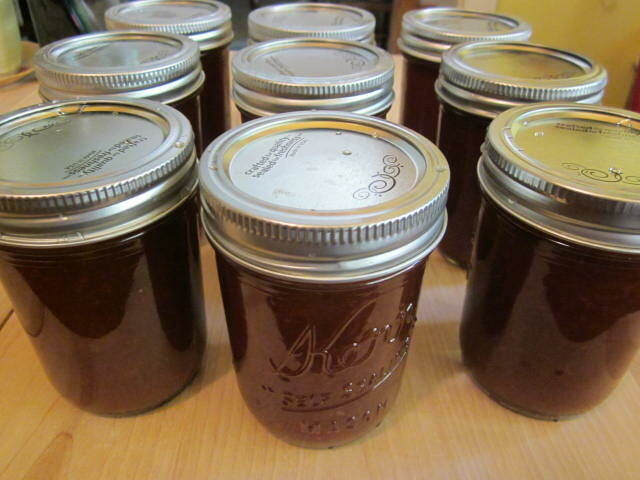 Fill jars with hot jam and put the lids on, but don’t tighten too much. As the jam cools, you’ll hear popping sounds which means the lids are sealing. When the jars are cool to touch, tighten the lids a bit more and refrigerate. Just started the cooking process. It was a real surprise to watch the cooked loquats turn a deep rich burgundy. Time to sleep in the crockpot all night and get nice and thick. I’m really happy with the results. It looks a lot like apple butter. Jars and jars of jam! I’m refrigerating them; didn’t feel like going through the hot bath canning process. I’m freezing some fruit whole to use in smoothies. Drying the leaves to make loquat tea. 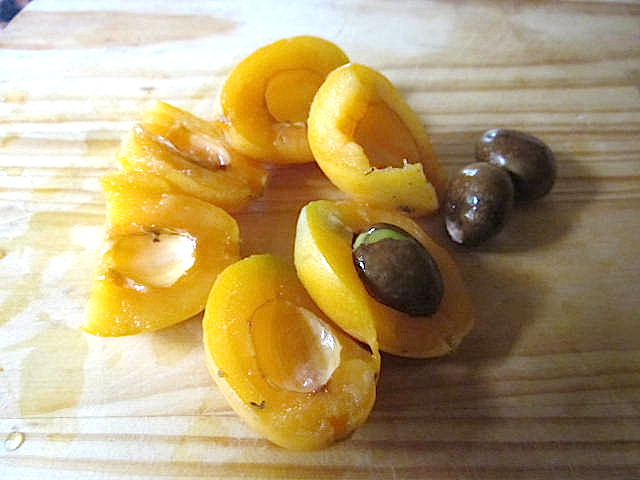 Loquat salsa, like mango salsa. 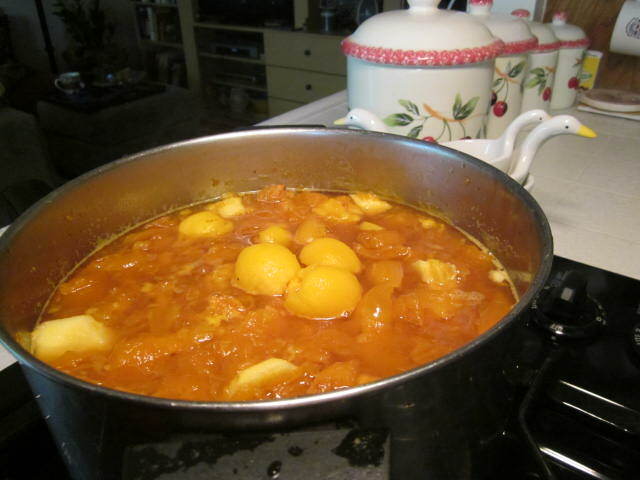 This entry was posted in All Posts and tagged Cook, Fruit, Fruit preserves, Germany, Health benefits of loquats, Home, Immersion blender, Italy, Jams Jellies and Preserves, Loquat, Loquat jam, Loquats frozen, Loquats in California, Spain by Enchanted Seashells by Princess Rosebud. Bookmark the permalink. I’ve never even heard of loquats, let alone tasted them. It looks and sounds delicious though!! I think they’re a treasure not too many people know about! I’ve never had a loquat. I’d never even heard of them. Some think it’s like a kumquat, but it’s not. I wish I had enough jam to send to everyone! May I reblog this? 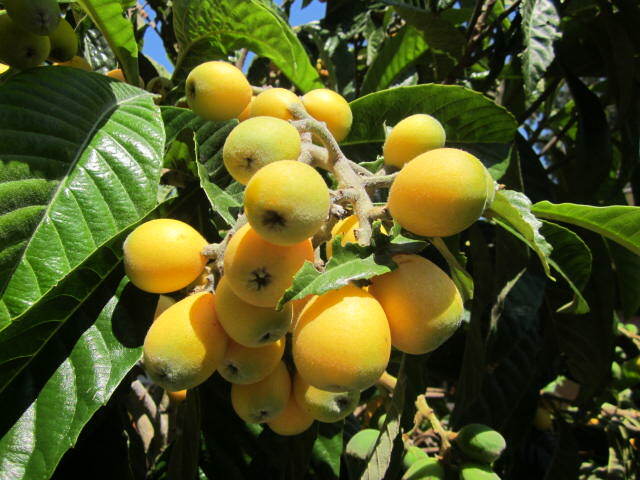 Do loquats grow quickly? How lovely of you! Yes, please reblog. I think they grow very quickly; I have volunteers from seeds all over my yard, but I’m not sure if they bear fruit unless you get them from a nursery…only my original one fruits. They are literally everywhere; I can see my neighbor’s tree from my deck too, they do nothing with their fruit, what a waste! That is a shame since they look like they would be tasty! 1) Yum, I want some. 2) Totally impressed you know how to do all of that. Thank you, but don’t be impressed, my mom and I made strawberry and peach jam and apple butter when I was little so I learned from a master. Since I’m adopted do I qualify for one of the jars of jam so I can try this delicious looking jam? I really love apricots & peaches, so I’d probably like locquats, right? I’m sure you would love it, but I can’t ship to anyone cos it needs to be refrigerated since I didn’t do the full-on canning procedure. So you’ll have to wait til you get here. I bet it would be easy to grow on a patio and it’s a beautiful tree. I’m adding the loquat to try when we get together. I’d never even heard of one until today. With you around, we’re gonna have a loquat-ini!!!! Woohoo! I can’t wait for that on my long list of to-dos with you! This looks delicious and I am one of the people who have never heard of it. Why? I wonder if they are like the Stasuma Oranges that grow in Louisiana- no ones heard of them either because they are entirely consumed within the state and so there aren’t any to ship to markets. Maybe the same situation? Where can I get my hands on some Mrs. Tugboat? I’m not sure, but we haVe satsuma oranges here too. I think you could grow loquats easily. I would start to send seeds out to people but they won’t bear fruit, at least none of the ones I’ve started from seed ever do, only the original tree! Interesting… I wonder if the tree is cross-polinating with another near by? The loquat? I don’t think so, I mean it started out life that way, but I don’t have that much botany knowledge! Now that looks delicious, but then everything you make does. 🙂 Put on some really good bread, and you’d divine. I like the chutney and salsa ideas too. Not everything! 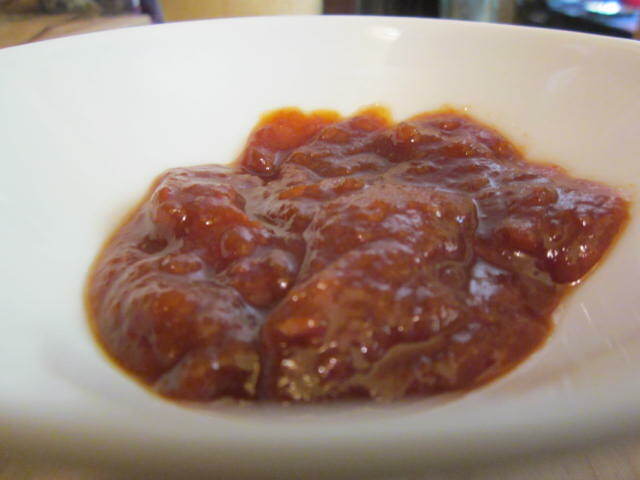 I tried loquat jam with a different recipe a year or so ago and it wasn’t very good. That’s why I’m so excited about this. Success! Me too, I’ve had to put mesh over some of my fruit trees cos the birds have taken bites out of so much! I don’t mind sharing, but this is ridiculous! I love grapefruit, send it our way! Citrus doesn’t seem to do great in our yard, which is dumb, cos we’re SoCal! Yeah, it should! We have a huge tree. It is ancient, but it produces. Niether of us can really eat it and it just goes to waste. Come up and get as much as you want!!! Seriously! 🙂 Bring a pick-up. I think the grapefruit is the first thing hubs craves when he gets home from being out to sea. He gets some fresh fruit, but when it runs out in the middle of the ocean, there are no stores and they have to wait. No problem cleaning them, let’s do that! Never tried loquats, but your jam looks yummy. Its only toxic in large amounts, and some people even make a liquor out of the seeds, not me tho, but I take the seeds out as I halve the loquats before I cook the jam. no seeds in mine, plus they’re huge so you’d know if you got one. I have never heard of a loquat before. They definitely don’t carry them in the produce section of my local grocery store. We have a Japanese Quince in our yard that bears fruit in the Fall and I have no idea what to do with them either, but I’ve heard they make good jam as well. I’m going to pin this for future reference! It’s so much easier for me to refrigerate jam than to do water bath canning, but that’s really the best way for large amounts. Quince jam sounds lovely! Loquats are rather delicate and don’t last a long time, probably why it does’t get sent to markets. I love freezing them too, to pop in smoothies. Thanks for sharing the recipe. We just moved into my deceased Father in Laws property and he has a few of these trees. We found out what they were and have so much fruit on them, I started researching for recipes. How many jars and what size was used for this recipe? Hi, I used 8 oz jars and some 4 oz Can’t remember how many, though. Freezing them is a great way to save them to pop in smoothies and other blended beverages.